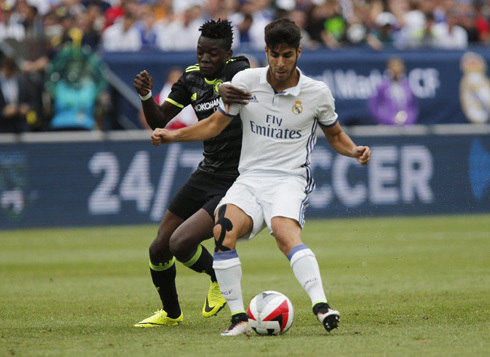 Real Madrid faced Chelsea in their second game of this US tour pre-season and they managed to pull off a 3-2 win against Antonio Conte's men. Marcelo with a brace and Mariano with a long range strike scored the goals for the Merengues. Coming off a 3-1 loss against PSG just a few days ago and even being aware this was only a pre-season friendly, Zidane knew it would be important to get back to the winning track. And that's what his men have done this Saturday night in Michigan, after beating Chelsea 3-2. 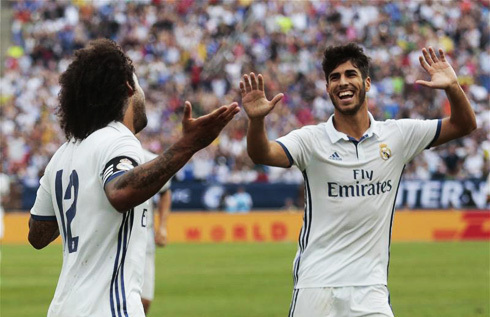 Unlike what had happened against Paris-Saint Germain where Madrid found themselves trailing by 3 still in the first half, this time around the Merengues did the exact opposite and earned a 3-goal before the half-time break thanks to 2 goals from Marcelo and another from the "Canterano" Mariano. The Blues would eventually find a way to cut down the gap in the last 10 minutes of the game and set the final score in 3-2, but it would still be Real Madrid leaving the pitch victorious. A lot of of the usual starters were still unavailable for this game, but that didn't prevent Zinedine Zidane from lining up a strong eleven this Saturday night against Chelsea. 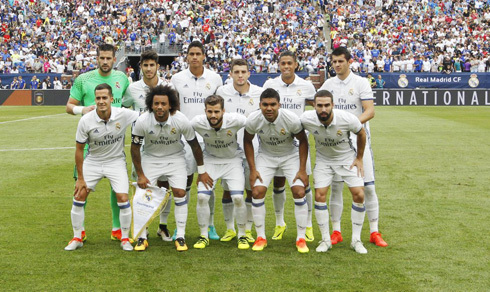 The Frenchman made a few changes to the team he had started with last Wednesday against PSG, bringing in Carvajal for Danilo in the right-back position and playing two Canteranos, Mariano Diaz and Marco Asenseio, who replaced Jesé Rodríguez and Isco. The first goal of the night took place around the 19th minute, when Marcelo received a short pass from Marco Asensio, cut inside looking for some space and then using his weaker foot (his right one), he slotted home the opener for Real Madrid. The shot still suffered a deflection in its way to the back of the net, but no credit should be taken away from the Brazilian left-back. Just 7 minutes later, the 28-year old superstar made himself noticed again, this time by scoring an impressive goal on a great run from the left. 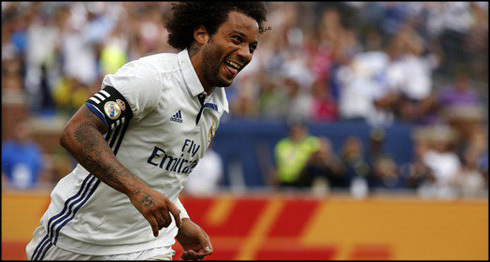 Marcelo started by intercepting a pass on the ground near the midfield line, combined with Asensio a few meters forward and then went all the way on his own until he found himself close enough to beat Begovic with his left foot. The was Marcelo's second goal on the night, his third in 2 games for Real Madrid this season. It seems the captain's armband is doing him well! We would still see Real Madrid getting one more before half-time and it would definitely be the goal of the night. Mariano Díaz made his scoring debut for the club after trading passes with Marcelo and striking from nearly 30-yards out. His shot had some resemblance with those we're used to see from Cristiano Ronaldo, who by the way, is still on vacation and is only expected to be back with the team by August 10. With 3-0 at half-time, Zidane didn't change a lot on his team coming into the second half. Only Danilo came in for Carvajal, as the Frenchman was reserving pretty much every substitution he had at his disposal for 20 minutes later. With a lot of youngsters coming in for the last minutes of the game, Real Madrid lost some of its defensive cohesion and allowed Chelsea to still catch them off guard twice before the final whistle. Éden Hazard scored two very similar goals through fast breaks and the score would end 3-2 in favor of Real Madrid. The Merengues will now have one final test before kicking off with their season and they probably couldn't have picked a stronger opponent for the time being. Bayern Munich and Real Madrid will go head to head on Wednesday night at the MetLife Stadium in New Jersey (United States), with kickoff set for 01:00 AM in Madrid time (GMT+2). Attackers: Alvaro Morata, Marco Asensio. Cristiano Ronaldo next game with Real Madrid is a pre-season friendly on August 3 of 2016, against Bayern Munich. You can watch Juventus live stream, Bayern Munich vs Real Madrid, Barcelona vs Leicester City, Manchester United vs Everton, Chivas vs Arsenal, and Liverpool vs AS Roma, all matches provided from our live football game pages.